There’s nothing like washing clothes in a laundromat to jostle your perspective on the things you take for granted. Last week I whipped to the closest coin laundry to wash a couple of dog beds and an old comforter. 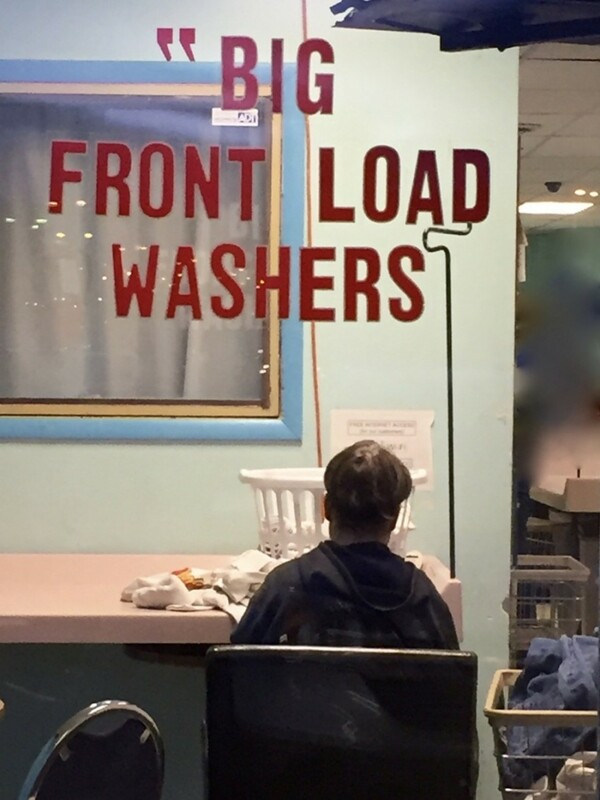 I was zipping along cramming the bulky items into one of those advertised “big front load washers.” But the door would not latch shut after I swiped my credit card (it’s still called a coin laundry, but plastic payment was a faster choice). Rats! That’s when I glanced over at a man with thick glasses at a side table drinking a Fanta® orange soda. With a Disney movie blaring from the mini screen above the dryers, I approached this stranger in my frustration. “Do you work here?” I quickly inquired. “No,” he mumbled, continuing to stare at his magazine. I rolled my eyes and partially huffed back to the broken washer, when this man’s voice pierced my irritated mood. “That’s why I always use the top loaders,” he offered. Now someone tells me! I bemoaned to myself. I found the coin laundry’s phone number online via my cell phone and talked to the real owner about my credit card charge for a machine I couldn’t use. That’s when I really noticed the petite man. My eyes followed him as he shuffled past me to another washing machine, sliding and leaning on his wooden cane and a rolling laundry cart. Standing tall, he may have reached my middle ribs. Instantly, a wave of humility surged over my annoyed attitude about finding another washing machine to use. The owner would refund me, but I didn’t care anymore. All I could think about was this disabled man quietly washing his clothes, sipping an orange soda. I wondered if he returned here week after week. Me? I’d only be back to wash another cumbersome dog bed. Between my washer and dryer trips, I retreated to my vehicle, but watched the diminutive man through the front window return to his spot at the side table. Painstakingly, he folded his white tube socks and blue towels. His cane resting on his laundry cart. There’s nothing like washing clothes at a laundromat to jostle your perspective on the things you take for granted. What everyday people or life circumstances have nudged you to count your blessings lately? Brave and Resilient Tip #134: Stay attuned to the everyday people who can jostle your perspective for the good. So many things, Beth. Most of us are blessed beyond belief compared to the rest of the world. Thanks for that reminder in what is becoming a “season of whining” over the current state of affairs! You are so right, Nancy. The “season of whining” is everywhere from politics to the food we eat. A bunch of other people came in the laundry and this fellow was so focused on his tasks at hand. Maybe I can drop by the laundry another Monday to see if he’s there and give him a Fanta six-pack. 🙂 I was a bit distracted last week.